The Distillery® Restaurant "Pick the Pros Contest” is offered during the NFL Regular Football Season Sunday games (weekday games, Wild Card games, Playoffs, Championship games and Super Bowl are excluded). 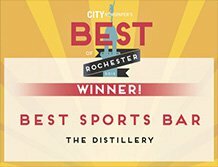 The Distillery Pick The Pros (the “Contest”) is open only to legal residents of metropolitan Rochester NY (Monroe, Genesee , Livingston , Ontario , Orleans, Wayne Counties) and metropolitan Syracuse NY (Onondaga, Oswego, Madison Counties) who are 21 years of age or older at the time of entry. Officers, directors and employees of Contest Entities (as defined below), members of these persons’ immediate families (spouses and/or parents, children and siblings and their spouses, regardless of where they reside) and/or persons living in the same households of these persons (whether or not related thereto) are not eligible to enter or win the Contest. Contest Entities, as referenced herein, shall include Sponsor and its respective parent, subsidiary and affiliate companies and administrative, advertising and promotion agencies and any other entity involvement in the development, administration, promotion or implementation of the Contest. Contest is subject to all applicable federal, state and local laws. Void outside Metro Rochester, Syracuse and where prohibited or restricted by law. HOW TO ENTER: Weeks 1-17: Participants must fill out the Pick The Pros Entry Picks at their designated The Distillery location. Participants may play at only one location, designated as their HOME location. Completed Entry Picks must be submitted by 1:30 pm Eastern Time each Sunday. Participants will not be able to alter their selections after turning in cards. Ballot entries will include name, date of birth, phone number, mailing address and email address. Participants attempt to pick the winner of each game and include a tiebreaker that consists of the total number of points of all games listed. Ambiguous or illegible picks will not be counted in the total score. Only one ballot entry per person will be accepted. Any participant who submits more than one entry on any Sunday will be disqualified from the contest and will be ineligible to win or share in any prize. Entries submitted after the 1:30pm cut off time each Sunday will not be counted in any scoring. POINT SCORING SYSTEM: Each correct pick is worth 1 point. Participants with 8 or more correct picks each Sunday (weeks 1- 17) will be automatically entered into a random drawing for the Grand Prize of a Sony 60” class (60” diag) 4K HDR Ultra HD TV which will be drawn at half time of the NFC Conference Championship Game (second game) to be held on Sunday, January 21st, 2018. TIEBREAKER: Total points of all the games listed on the ballot that is the closest to the actual point total without going over. Tiebreaker will only apply if more than one player has the most correct picks and to determine the ranking of the five highest players when necessary. If all tied participants go over the total points scored, closest to the actual score will be declared the winner or next highest-ranking player. In the event there is still a tie, a random drawing conducted by Management will determine the winner or next highest-ranking player. All results from random drawings are considered final and indisputable at the sole discretion of Management. Each week’s results will be tracked internally at each location. Winners will be announced the following Sunday at 3pm, including the winner for Week 17. NO PRIOR NOTIFICATION WILL TAKE PLACE THROUGHOUT THE SEASON. Winning participants MUST be present at 3pm on the following Sunday at their home location to collect their prize. Failure to appear in person at the 3pm time will result in forfeiture of all prizes to the next highest-ranking player, UP TO THE FIFTH PLAYER. No prize(s) will be awarded beyond the fifth ranking player. The $100 Gift Card for a perfect pick will only be forfeited to the next ranking player (if any) who also has a perfect pick and will not be forfeited to any player without a perfect pick for that week. No purchase or other consideration is permitted, required or otherwise necessary to participate in the contest. Any consideration, payment, obligation to pay, share or donate to participate, submit selection or receive any prize voids contest selection. The decision to award prizes or not is reserved solely to The Distillery® Restaurant management. The Distillery® Restaurant reserves the right to change the rules and or substitute prizes described in this contest if they are no longer available. The Distillery®'s Pick the Pros Contest is a proprietary promotion owned by The Distillery® and may not be used in whole or in part without obtaining written permission from The Distillery®. The Pick The Pros Entry Ballots are the property of The Distillery® Restaurant. and may only be used for the purposes for which they were intended and no other purpose. GRAND PRIZE WINNER SELECTION: A random drawing of all eligible entries will take place during half time of the NFC Conference Championship Game on January 21st, 2018. Contestants must be present to win. ONE (1) GRAND PRIZE: Sony 60” class (60” diag) 4K HDR Ultra HD TV will be awarded to the winner at each location. Sponsor reserves the right to substitute prize of equal or greater value. No substitution or transfer of prize by the winner is permitted. Contestants will not be eligible to win the grand prize at more than one location. WINNER NOTIFICATION/RELEASES: Potential Grand Prize Winners will be notified by text and/or email at the phone number and/or email address provided that they are eligible for the Random Drawing on Sunday, January 21ST 2018 and must be present to win. The Grand Prize Winner of the random drawing will be required to execute and return a notarized Affidavit of Eligibility/Release of Liability and/or Publicity Release Form (unless prohibited by law) within five (5) days of notification in order to claim the prize. If the Grand Prize winner fails to sign and return required documents within the required time period, he/she will forfeit any prize even though his/her name may have been shown/announced publicly. If the Grand Prize Winner is ineligible or disqualified for any reason, Sponsor, in its sole discretion MAY award the prize to an alternate potential prize winner by drawing another name from the eligible participants. Grand Prize winner will be issued an IRS Form 1099 for the value of the prize and is advised to seek independent counsel regarding the tax implications of his/her respective prize winning. CONDITIONS: By entering Contest, each Participant agrees for Participant and for Participant’s heirs, executors, and administrators (a) to release and hold harmless Contest Entities and their respective officers, directors, and employees (collectively “Released Parties”) from any liability, illness, injury, death, loss, litigation or damage that may occur, directly or indirectly, whether caused by negligence or not, from such Participant’s participation in the Contest and/or his/her acceptance, possession, use or misuse of prize or any portion thereof (including any travel related thereto); (b) to indemnify Released Parties from any and all liability resulting or arising from the Contest and to hereby acknowledge that Released Parties have neither made nor are in any manner responsible or liable for any warranty, representation or guaranteed, express or implied, in fact or in law, relative to prize; (c) if selected as a winner, to the posting of such Participant’s name on website and the use by Released Parties of such name, voice, image and/or likeness for publicity, promotional, and advertising purposes in any and all media now or hereafter now or hereafter known, throughout the world in perpetuity, without additional compensation, notification, permission or approval and, upon request, to the giving of consent, in writing, to such use; and (d) to be bound by these Official Rules and to waive any right to claim any ambiguity or error therein or in the Contest itself and to be bound by all decisions of the Sponsor, which are binding and final. Failure to comply with these conditions may result in disqualification from the Contest at Sponsor’s sole discretion. ADDITIONAL TERMS: Sponsor reserves the right to permanently disqualify from any promotion any person they believe has intentionally violated these Official Rules. Any attempt to deliberately damage the Contest or the operation thereof is unlawful and subject to legal action by Sponsor, who may seek damages to the fullest extent permitted by law. Entries that are incomplete, unintelligible or corrupted are void and will not be accepted. Sponsor is not responsible for lost, late, stolen, incomplete or otherwise misdirected entries that are processed late or incorrectly or are lost due to system malfunction or other error. All entries become the property of Sponsor and will not be returned. By participating, Participants unconditionally accept and agree to comply with and abide by these Official Rules and the decisions of the Sponsor. The failure of Sponsor to comply with any provision of these Official Rules due to an act of God, hurricane, tornado, blizzard, flood, war, fire, riot, earthquake, terrorism, act of public enemies, actions of governmental authorities outside of the control of Sponsor (excepting compliance with applicable codes and regulations), or other “force majeure” event will not be considered a breach of these Official Rules. Released Parties assume no responsibility for any injury or damage to Participants’ entry; for errors in any promotional or marketing materials or in these Official Rules; for any human or electronic error or for entries that are stolen, misdirected, garbled, delayed, lost, late, damaged, or returned. Sponsor reserves the right to cancel, modify, or suspend the Contest or any element therefore including without limitation, these Official Rules) without notice in any manner and for any reason (including, without limitation, in the event of any unanticipated occurrence that is not fully addressed in these Official Rules). In the event of cancellation, modification or suspension of Contest, Sponsor will make reasonable good faith efforts to execute the promotion. Notice of such cancellation, modification of suspension will be posted at website. Sponsor may prohibit any Participant or potential Participant from participating in the Contest, if such Participant or potential Participant shows a disregard for these Official Rules; acts with an intent to annoy, abuse, threaten or harass any other Participant, Sponsor, or Sponsor’s agents or representatives; or behaves in any other disruptive manner (as determined by Sponsor in its sole discretion). USE OF DATE/PARTICIPANT’S PERSONAL INFORMATION: The Sponsor will be collecting personal data about Participants when they enter/participate in the Contest. The Sponsor may disclose the Participant’s personal information only in any manner consistent with the Sponsor’s statement on privacy located at https://www.thedistillery.com/privacy-policy Participants will have the opportunity to receive information from Sponsor by checking the appropriate box. If at any time, you no longer wish to receive materials from Sponsor, please go to the Sponsor’s Privacy Site and follow the procedures listed. NON-AFFILIATION DISCLAIMER: This Contest is not in any way affiliated with, sponsored or endorsed by the NFL or its institutions. WIN LIST: For the Sony 60” class (60” diag) 4K HDR Ultra HD TV winner, the sponsor reserves the right to publish the name of each winner at thedistillery.com All participants consent to this publication by their participation in the contest.